As we search far and wide to put together the world's greatest staff, I thought it would be nice to share the thoughts of some of the people who have worked for us before. We started by asking some of our 2013 staff to just tell us about their experiences on staff. We'll start her with Danny Verb who is going to become a 10-year man in 2014! Anybody that's ever worked at North Star is welcome to contribute! Just email your story to Andy@NorthStarCamp.com if you'd like to share. Hey there! 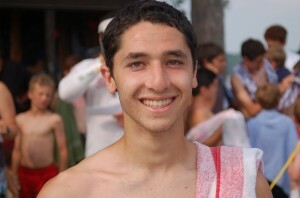 My name is Danny Verb from Riverwoods, Illinois and the summer of 2014 will be my tenth year at North Star. Working at camp has been such a treat and I look forward to going back year round. There are so many great things that highlight why I love working at camp but the one that means the most to me is being able to help campers overcome challenges. Whether I was just there to watch a camper get a new archery award or I coached him on how to get up the rock wall, seeing how happy they are brings an indescribable, addicting feeling. As a camper I made strong relationships with the counselors at camp that still last to this day and as a counselor I’ve appreciated being able to be a role model who kids look up to. I’m happiest during the summer months and it is because of how rewarding and enjoyable the experience of being a counselor is. Apply Now to Work at North Star this summer!